One of the Interweb’s most recently developed art forms is the Unboxing. The Internet trend of showing photos or video from the unpacking of a retail box of some desirable product, such as the latest laptop or portable music player. Since we try to remain fashion forward, it’s time to hold our very first Not A Mystery Unboxing. Thanks for that Sarah. We will now proceed to Field Dress a Box before your very eyes. 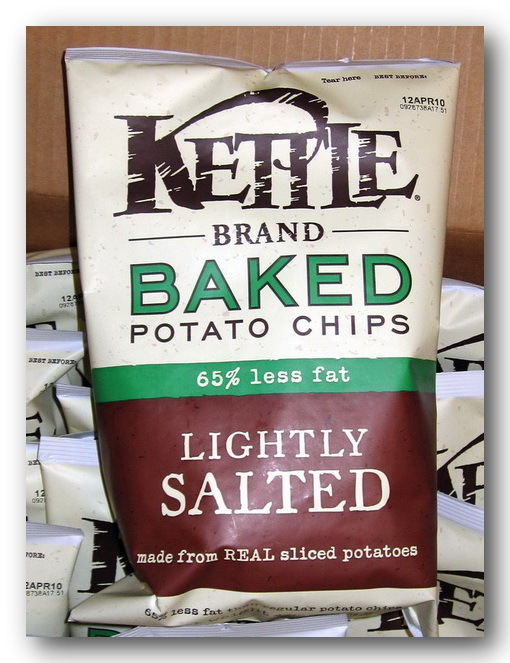 For this Unboxing we’ve chosen a recent purchase from Amazon; Kettle’s Lightly Salted Chips (Crisps to you Brits), 4-Ounce Bags 15-Pack. We chose this product because (a) it was recent, (b) it was large. Plus, the fact that it consists of Chips makes it sound Hi-Tech. Unboxing Is The New Field Dressing, Take Note Sarah! The outer package as delivered by UPS 2nd Day Air from Amazon (free with our Amazon Prime membership). Note the Fragile sticker, which is a bit of a head scratcher for a box of Potato Chips, but I guess you can never be too careful. Poping open the outer Amazon shipping box, we see brown butcher paper. No plastic air bags or bubbles in this box. 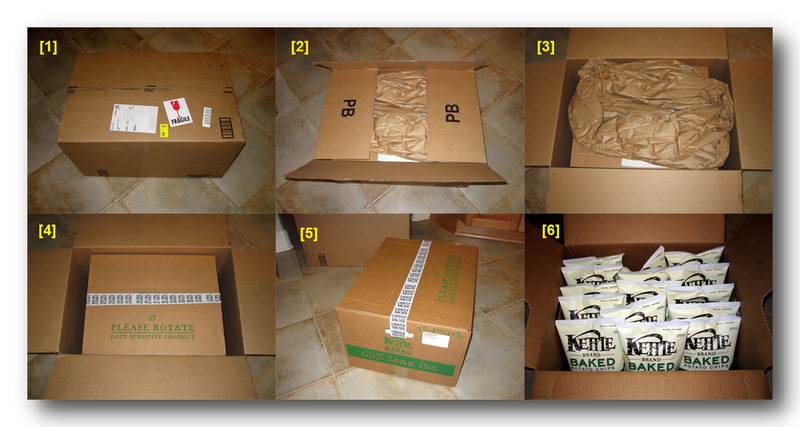 Very Green; shout-out to Amazon for sustainable packing! Opening the outer box a bit more we see that in fact we have an inner package. And now we can see the original Kettle’s master pack box. Shipping specialists will note that although there is no cushioning between the outer and inner box on the sides, that the boxes have maintained their good alignment. Perhaps the Fragile notice induced UPS to play nice during shipment? We’ve now taken the outer Amazon shipper away and what remains is the Kettle master pack. 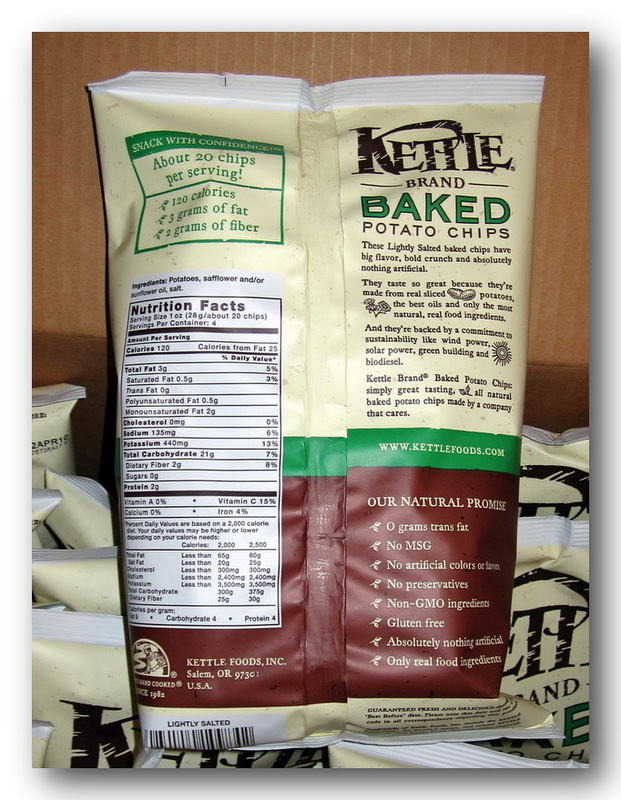 Note the white tape seal across the top says “Lightly Salted” to avoid confusion and add authenticity. Well done, Kettle! And finally, we open the Kettle shipper and see our individual packs of Chips or Crisps, standing straight up at attention, like pert Little Rogues. Bravo. To sum up. Great product, met all our expectations with no surprises. Quality of Chips/Crisps and packing excellent. 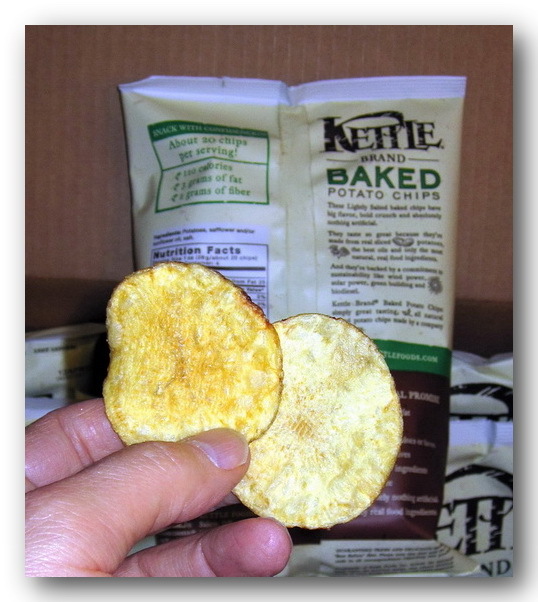 Amazon and Kettle doing a good job of producing and delivering a sustainable, REAL, Chip/Crisp. Having gained some confidence in this our first Unboxing, the plan is to next take on a product with moving parts. I’ll give it a try. Do they come in big boxes? Large bag but you don’t have to have them shipped wasting the earth’s valuable resources such as cardboard and fuel. But be warned they are addicting. I was going to delete the comments for you, but decided to leave them, as other people might have the same problem. Every once in a while (but not very often) photos don’t show up on the blog, I’m not sure why. As in your case, they seem to come right back if you re-load the page. But overall WordPress.com is fantastic and I highly recommend it for anyone who is thinking about a blog. Tons of features, they do all the work for you on the back end plus it’s even free!